President Donald Trump signed an executive action Wednesday to block federal grants from immigrant-protecting "sanctuary cities," and it's receiving strong reactions in the D.C. area. Immigration rights protesters blocked streets near the White House Wednesday night. D.C. as well as Takoma Park, Maryland, and Prince George's County, Maryland, operate as sanctuary cities that do not cooperate with federal immigration authorities. The order could cost locales that do not cooperate millions of dollars. 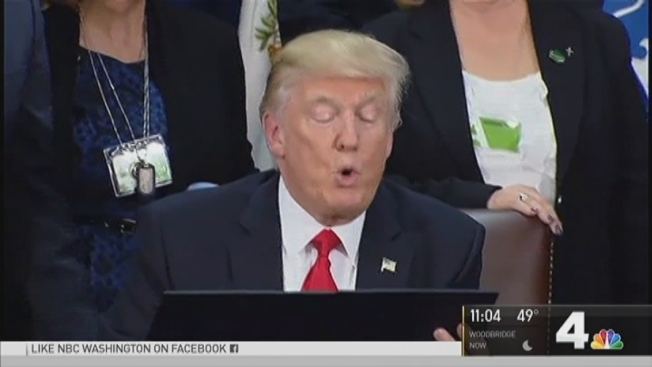 President Donald Trump signed an executive order Wednesday that could limit federal grant funding to local governments that protect undocumented immigrants. News4's Kristin Wright has the story. "We're going to strip federal grant money from the sanctuary states and cities that harbor illegal immigrants," White House press secretary Sean Spicer said at a news conference. "The American people are no longer going to have to be forced to subsidize this disregard for our laws." 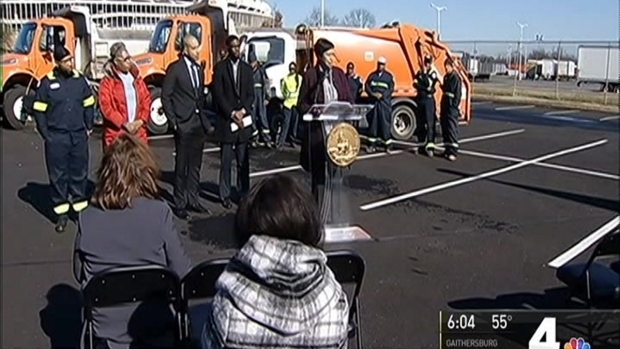 D.C. Mayor Muriel Bowser called a news conference Wednesday evening and said city officials are working to determine the potential impact of the order. "There's a lot left to be interpreted in what I can see in the executive order thus far," Bowser said. Arlington County, Virginia: Arlington officials also do not categorize the county as a sanctuary area. A spokeswoman said the county complies with all federal immigration laws. Montgomery County, Maryland: A spokeswoman for Montgomery County said the county cooperates with U.S. Immigration and Customs Enforcement when they are asked about serious offenders. County officials do not categorize the county as a sanctuary area. Still, County Executive Isiah Leggett said he would challenge any attempt to cut off federal funds because of Trump's action. “Clearly, we’re going to fight that, and if needed, we will take appropriate legal action to resist,” he told The Washington Post. Montgomery County police do not ask people about their immigration status. "We believe that this is the right balance for this county, " a spokeswoman said. Prince George's County, Maryland: The county does have sanctuary city status. County Executive Rushern Baker said the county's position on protecting immigrants is not going to change. "We believe that the county is following the law and we're going to honor that. So, we're not changing," he said. "We're not afraid of what, you know, the president said, that he's going to withold [funds], because we think we're doing the right thing and we're following the law, and as long as we're doing that, our policies will not change." Baker said he expects the county's federal delegation to ensure they do not lose critical funding. Takoma Park, Maryland: Takoma Park published a statement on the city's website on Wednesday saying the city is "proud to be a sanctuary city." City officials are reviewing the executive order to determine "the potential implications for Takoma Park." Many immigrants attended a rally Wednesday afternoon in the Columbia Heights neighborhood of Northwest D.C.
One woman at the rally, who declined to provide her name, spoke against divisions between undocumented immigrants and others. "I believe that everybody has that right, to call another place their home," she said. Bowser spoke, at an unrelated news conference earlier Wednesday, about protecting the city's sanctuary status, and about fear among immigrants. "We have gotten a lot of questions and calls and feelings of anxiety, especially from families who fear it means they could be torn apart," the mayor said. Bowser said functioning as a sanctuary city protects residents. "We want people, D.C. residents, to not fear calling on their government. When people fear calling the police or calling on the government for help, it makes the entire city less safe,' she said. In Frederick County, Maryland, Sheriff Chuck Jenkins said Trump's executive order must be in place. "I think it's a right decision for America. I think it's a right decision for counties and communities that have felt the impact of crimes committed by illegal immigrants," he said. "Everybody in the world wants to be in America, but we simply can't accommodate that," the sheriff continued.